So, you've decided to partner with an answering service. Your next question may be, how do I decide between a premium or commodity service? There are several factors you should consider in making this decision, and it is best to first do a cost benefit analysis to decide whether it is worth allocating funds toward a premium or collateral service. Below we have highlighted some ways that a premium answering service goes above and beyond a commodity service in handling your calls. The first factor that differentiates a premium versus a commodity service is the company culture and hiring practices. A commodity answering service is typically "quick to hire and slow to fire." Because their services provide cookie-cutter options for all clients, they are simply hiring to fill a spot. A premium service, on the other hand, takes the time to get to know potential applicants at a fundamental level to determine the right person to handle your account. Dexcomm's lengthy interview process ensures that the person servicing your account has proper diction, tone of voice, spelling, and typing skills. This reduces errors on our end because we understand that your time is valuable. We work hard to hire individuals who will demonstrate our core values of concern and compassion to callers every day they are taking calls. Although our hiring process is stringent, Dexcomm has higher staffing levels than many in the industry, which allows us to answer your calls in three rings or less and have a lower tolerance for abandoned calls and hold time. A commodity service, on the other hand, will normally have a lower staff ratio, equaling higher hold time for your callers. Because of Dexcomm's larger staff, we are able to have "all hands on deck" at times of peak call volume. By hiring locally, we are able to benefit our community and make a difference in the lives of our staff. Our six core values are: Compassion, Concern for Others, Fun, Adaptability, Integrity, Positive Attitude, and Personal Growth. We use our core values in hiring staff to ensure they align with our mission. These values manifest in various ways throughout the organization and are essential in making Dexcomm a Top 10 Association of TeleServices International (ATSI) quality award winner. We implement our core values into every process at Dexcomm. Our core values come into play during feedback, motivating, evaluating, promoting and when necessary, firing. Adaptability is one of the core values most integral to our operation. We expect our employees to be adaptable every day. We encourage our operators to mentally sit in the receptionist’s chair for the offices they are representing. Dexcomm strives to be an extension of your office. We do not simply say "the office is closed" and take a message. Instead, we represent your office just as you would. Our mission statement is "Compassionate, Professional Concern for the Caller, Customer, and Coworker." This company purpose ensures that each employee understands their role in serving the needs of every caller and customer. Our executives spend a great deal of time and effort making Dexcomm a great place to work and keeping employees happy. Unlike most answering services which do not offer benefits packages for their employees, Dexcomm offers a hefty benefits package to ensure a high retention rate. A high retention translates to client success because happy workers are productive workers. With less personal stressors, our employees are fully committed to their work. This means that our clients do not have to get reacclimated with new business relationships. Stability in our organization equals peace of mind for you, so you can focus on your core competencies. Another difference between premium and commodity services is participation in answering service industry organizations. Dexcomm participates in four industry organizations: ATSI, Canadian Call Management Association, National Amtelco Equipment Owners, and we are a preferred provider for the New Orleans Dental Association. Dexcomm is an exemplary member of these organizations and is often asked to feature an employee as a keynote speaker at industry conferences, validating our status as industry leaders. Because of this, Dexcomm is able to keep up with industry best practices in every area that can benefit our customers, from the latest technology to new systems and procedures. Training is another area which differentiates premium versus commodity services. At commodity answering services, operator training is limited to basic telephone answering skills (TAS). Dexcomm employs an innovative and comprehensive training protocol for all staff. Our training staff includes an educator and three registered nurses. Operators go through an extensive training period to ensure that they have a wealth of experience on HIPAA compliance and other medical protocols. At a commodity answering service, the training period is typically limited to two weeks or less. At Dexcomm, our staff is trained for six weeks before even handling a live call. Each operator must pass a series of written and practical tests, including role-playing, before they are allowed to serve our valued customers. Our HIPAA training particularly, is unsurpassed. Our HIPAA training is led by an attorney who specializes in healthcare law and keeps our staff up-to-date on the latest changes and additions to the law. This ensures that we maintain HIPAA compliance throughout the organization. This translates to peace of mind for your business because it greatly reduces the possibility of a breach in compliance and thus lessens your legal liability. Commodity services, on the other hand, often have a limited HIPAA focus. Premium answering services incorporate a quality assurance program into their best practices. Call grading is the primary component of quality assurance for an answering service. While a premium answering service will grade a statistically significant number of calls per month, commodity services typically have limited call grading. Our quality assurance staff ensures that our operators are consistently held to Dexcomm's standards for excellent customer service. Not only will the operators handling your account be trained in the highest-quality TAS protocols, their call handling will remain consistently professional and thorough due to our in-house quality assurance program. Our quality assurance system was designed so that each caller is treated politely and professionally, and that an accurate message is taken. Our quality assurance team meets monthly to assess our current grading standards to make certain that all graders adhere to our high standards. They also pinpoint areas where operators can improve the quality of their calls, both individually and as a group. Having multiple graders on our quality assurance team prevents bias and ensures accuracy in your call grading and handling. A commodity service typically has a single QA format that does not prevent grading bias. Our quality assurance is also validated by external inspections from industry organizations. Dexcomm frequently finishes in the Top 10 in industry quality competitions. On top of having multiple graders on our quality assurance team, we also have a different grading scale for each client. We use proprietary grading criteria for different customer industries to ensure that each caller is being treated appropriately. Additionally, our graders are flexible in meeting the needs on every call. Also, you can customize your scripting and quality assurance standards according to the needs of your business. At a commodity service, there is typically a blanket grading system for each client. A commodity service will typically have a limited onboarding process for their clients, as opposed to a premium service, which ensures that your account is set up properly. At Dexcomm, our onboarding team works with your staff to design your call experience around your specific needs and budget. Our onboarding team is unusual in that it employs a multidisciplinary approach, including leaders from most company departments, preventing any minute details from "slipping through the cracks." A thorough and specific onboarding procedure ensures better communication throughout our relationships with clients. Our scripting software guarantees that your messages are properly delivered and offers the flexibility to customize your account the way you need to. 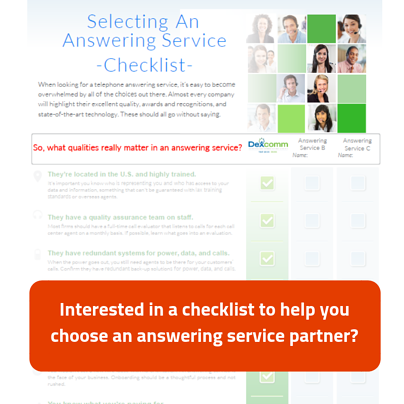 A premium answering service will typically employ cutting-edge technology to ensure that their client's needs are met. At Dexcomm we utilize the latest and most sophisticated scripting software in the industry. This allows us to route calls received to the proper channel. Call distribution has a major impact on the experience the caller receives when speaking to your answering service partner. Calls that are routed efficiently are answered faster and by an operator who is highly trained to understand your industry and business. Here at Dexcomm, we have eight distinct operator training levels ranging from basic TAS to Certified Medical Operators who are experts in HIPAA compliance and medical answering protocols. Our complex call distribution system ensures that every call we receive is routed to an agent who is trained specifically to handle your needs. When it comes to telephony and redundancy, there is a big difference between a premium and commodity service. A commodity service will typically have limited redundancy, leading to occasional down time which could result in missed calls. However, a premium answering service will have backups for power, telephony, and data to ensure that your calls will always be answered in a timely and efficient manner. At Dexcomm we think "What is the point of having an answering service who cannot be there when you need them?" Keeping this in mind, we have three backups of redundancy in place to make sure that no call ever goes unanswered. When you need it most, you will be glad that a premium answering provider made the extra investment on your behalf to continue to service your business. 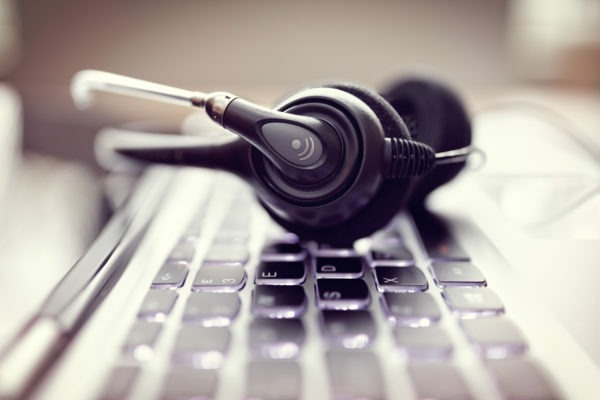 While it is ultimately up to you and the needs of your business to determine whether a premium or commodity answering service is right for you, we hope that this blog has helped you understand the difference between the two offerings.